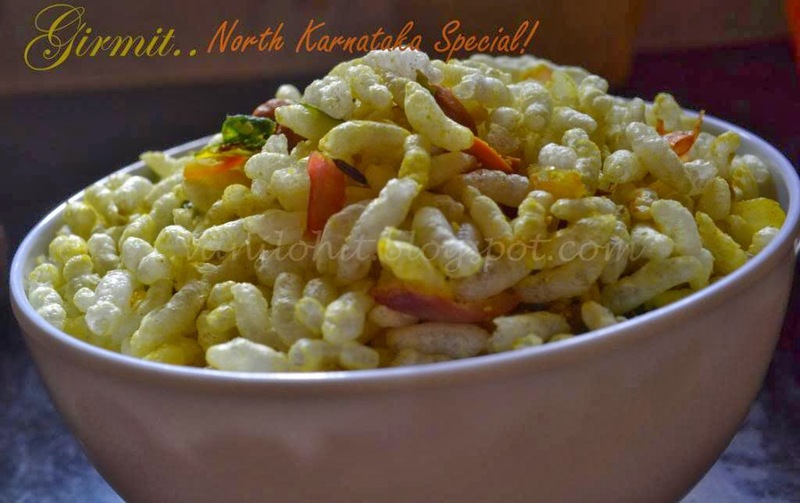 Girmit is a special snack variety of North Karnataka region. 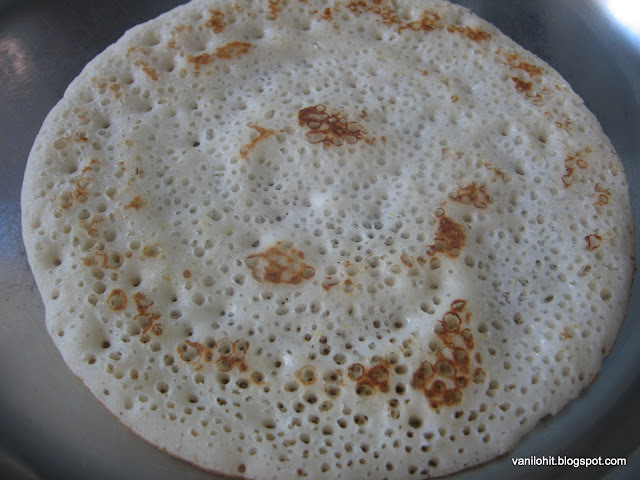 It looks bit similar to churumuri, but the ingredients used here are totally different. For Girmit, we use split peas (called as Putani in Kannada) powder which will give a unique taste to this snack. Whenever we travel to native by train, we would love to have Girmit / Churumuri which will be sold by Chaatwalas during the journey. Chop the onion thinly. 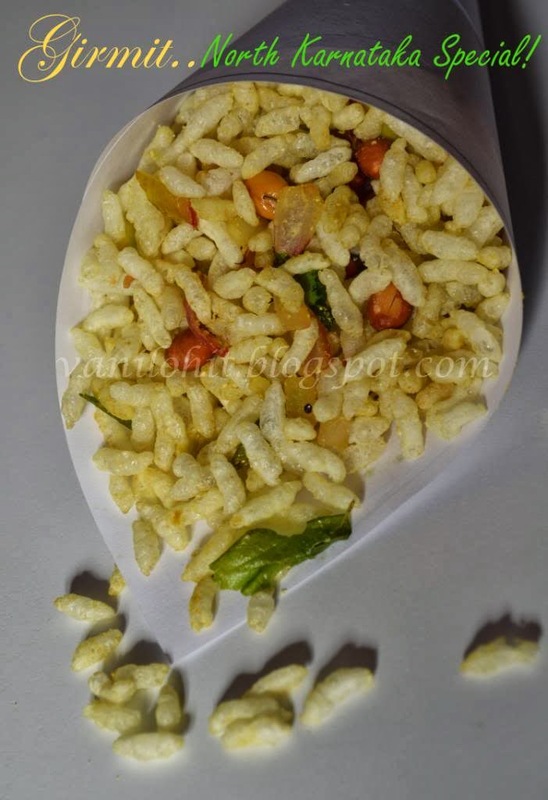 Heat the puffed rice on low flame for 4 - 5 minutes or till crispy. Heat oil in a pan; roast the groundnuts and then, add mustard seeds, cumin seeds, turmeric, curry leaves and green chilli paste. Then add chopped onion, saute for two more minutes and switch off the flame. Add salt, sugar and lime juice according to your taste. Now, add the puffed rice to the seasoning and mix it nicely with your hands. Check and adjust the taste. Finally, add the chopped coriander and split peas (putani) powder and mix it well. Transfer it to the serving bowl and serve immediately! If you have added more salt or lime juice to the Girmit, try adding little more split peas powder in order to adjust the taste. 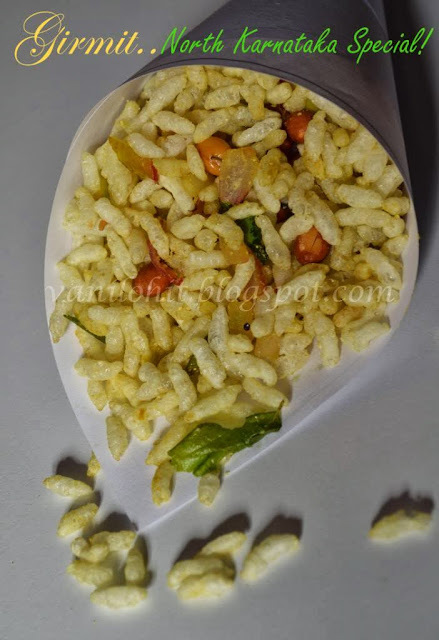 If you are serving the Girmit sometime after preparation, keep the seasoning ready and mix it with puffed rice just before serving. Try to finish it off quickly after mixing. Else, the mixture will loose its crispiness and won't taste that good. I always think that there are many similarities between Kerala kitchen and Karnataka Havyaka's kitchen. Because Kerala people use coconut and coconut oil generously in their cooking. The same way, we Havyakas in Karnataka also love to use coconut and coconut oil in our cooking. These days, due to cholesterol fear, people started using more of sunflower oil and other varieties of oils. But to get the real taste of traditional Havyaka recipes, one must use grated coconut and coconut oil generously in cooking. 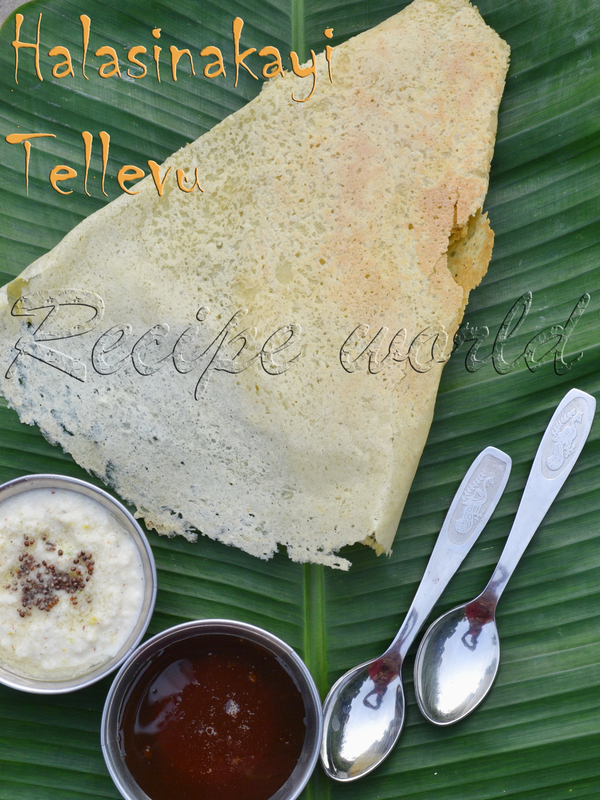 Why I am talking about Kerala Kitchen today is, I am going to share a Kerala cuisine recipe today. 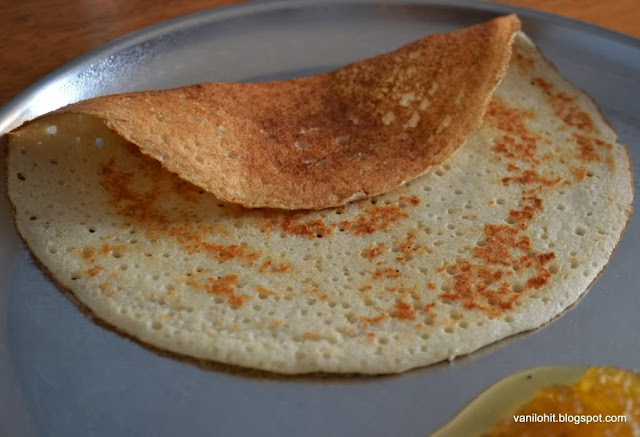 This looks bit similar to one of the famous Havyaka recipe Paladya, but both taste differently! Like Paladya, Pulisheri also tastes better when we use coconut generously. ;) With the nice aroma of cumin seeds and green chillies, this curry tastes very good with rice. Peel the cucumber and cut into medium size cubes. Add enough water (2 cups approx. ), slit green chillies and a big pinch of turmeric and cook it till soft. Once its half-way done, add salt to taste. Grind the coconut, cumin seeds and remaining turmeric into fine paste. Once the cucumber pieces are cooked, add the ground paste and boil it nicely for 2 - 3 minutes. Finally, add curry leaves and switch off the flame. 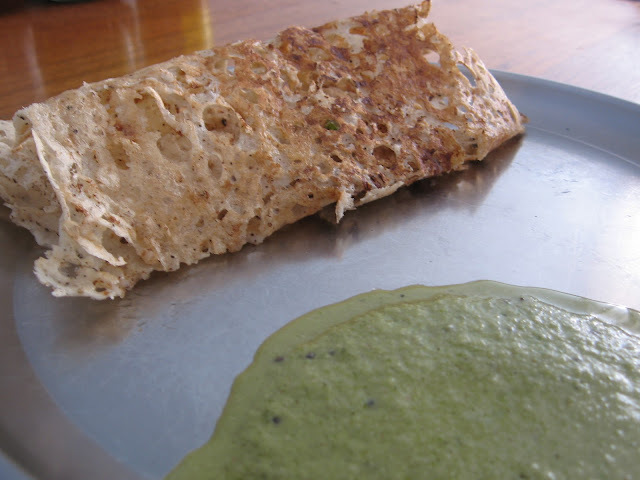 Do the seasoning with fenugreek seeds, red chilli pieces and mustard seeds and add it to the Pulisheri prepared. 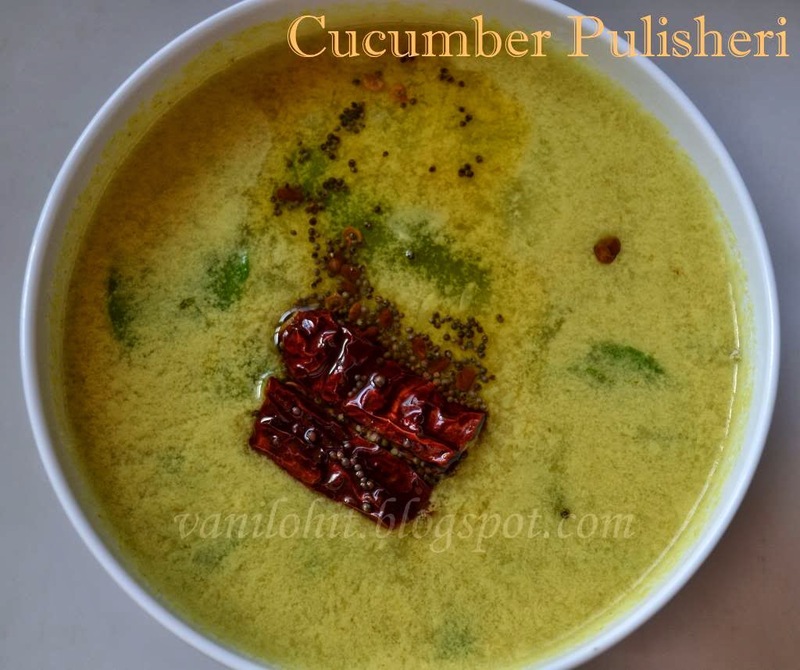 When the Pulisheri is warm, add buttermilk / curd according to taste and serve with rice. 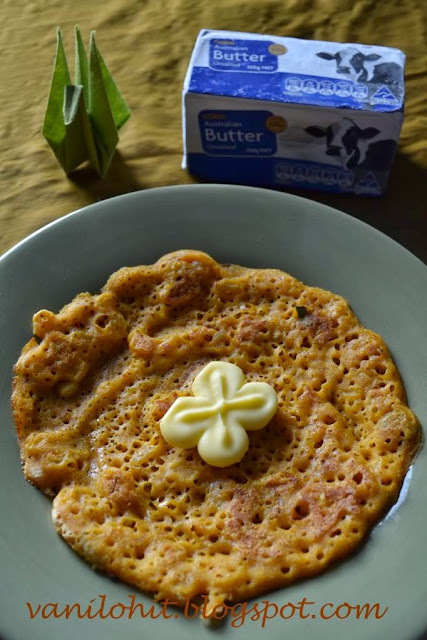 If you are preserving Pulisheri for the night or next day, keep it without adding buttermilk. Heat it before serving and mix with buttermilk. 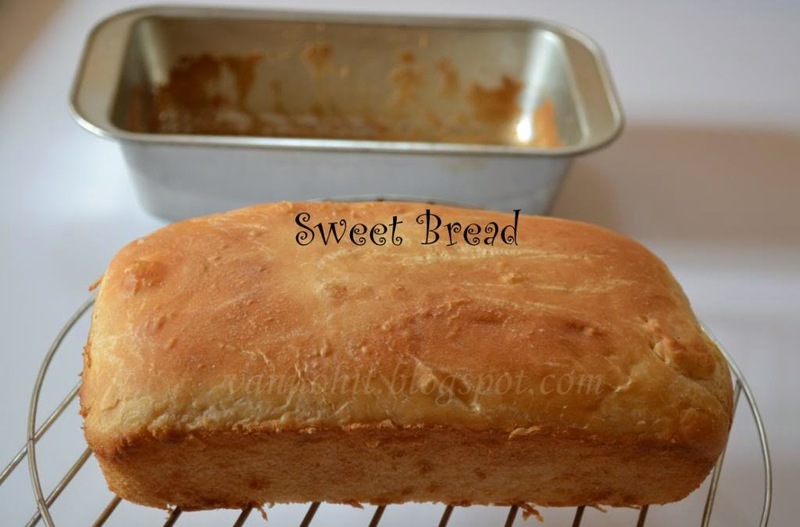 I am one of the great fans of sweet bread from my childhood. 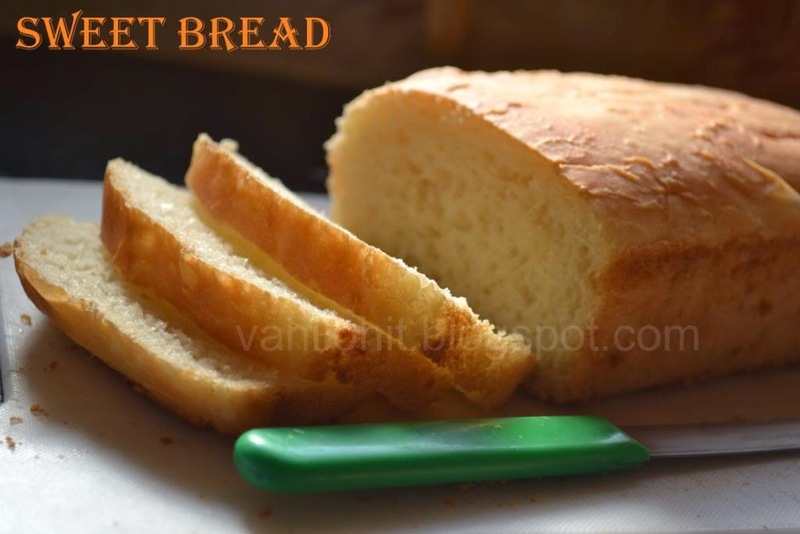 Never I will get bored of eating bread slices roasted with ghee :) During our stay in Australia, I was missing sweet bread very much and later, got a bread mould for preparing bread at home. But I couldn't use it much and it was sitting idle. My bread baking adventure was started very recently. The reason is that we won't have a good bakery nearby. If I need bread anytime, I have to wait till we go for groceries! So, just thought of preparing bread at home :) My first experiment was not good, but I got very good results in my later experiments. 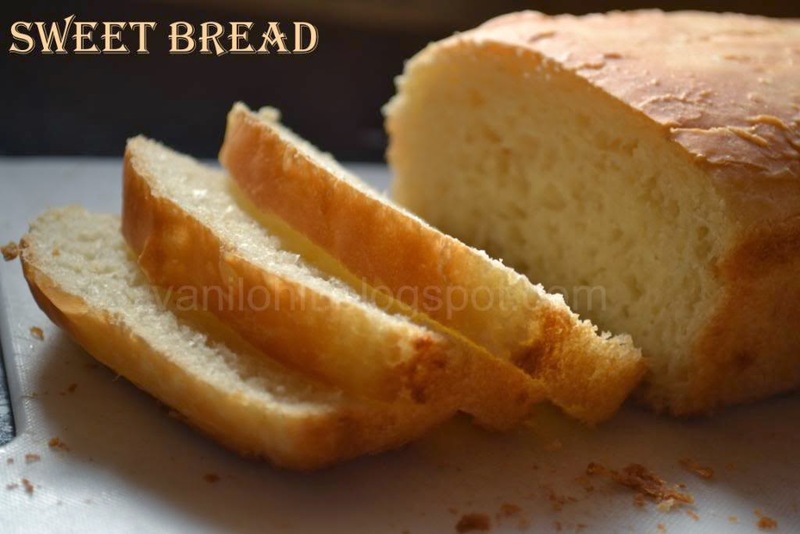 These days, we started loving home made bread than what we get from the shop! Dilute sugar in warm milk. Pour the yeast into the milk and mix it. Keep it closed in a warm place for 10 minutes or till the yeast grows. Mix salt and all purpose flour in a bowl. Make a well in the middle and pour the yeast mixture. Mix it nicely and knead the dough for at-least 10 to 15 minutes. Keep in mind that kneading the dough well is very much important to give a nice texture to the bread! Add 5 - 6 tsp of oil or melted butter to the dough and mix it lightly. Keep it closed with a damp cloth for 1 hour. By that time, the dough will get doubled in quantity. After an hour, take out the dough and knead it lightly to remove the air in the dough. Transfer the dough to a greased bread mould and keep covered with a damp cloth for 30 minutes. Pre heat the oven to 180°C. Keep the baking pan on lower rack and bake it for 30 minutes. Once done, take the bread pan out and allow to cool. Cut it into slices once it is completely cool. This bread tastes better the day after preparation and not immediately. 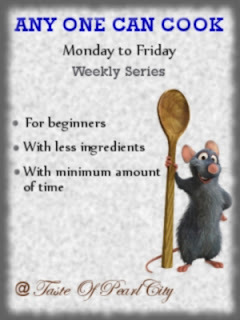 Or use it after 4 - 5 hours of preparation. Looks like mango season has started now in India. This is the time when varieties of pickles are prepared using raw mango, especially in Malnad region. 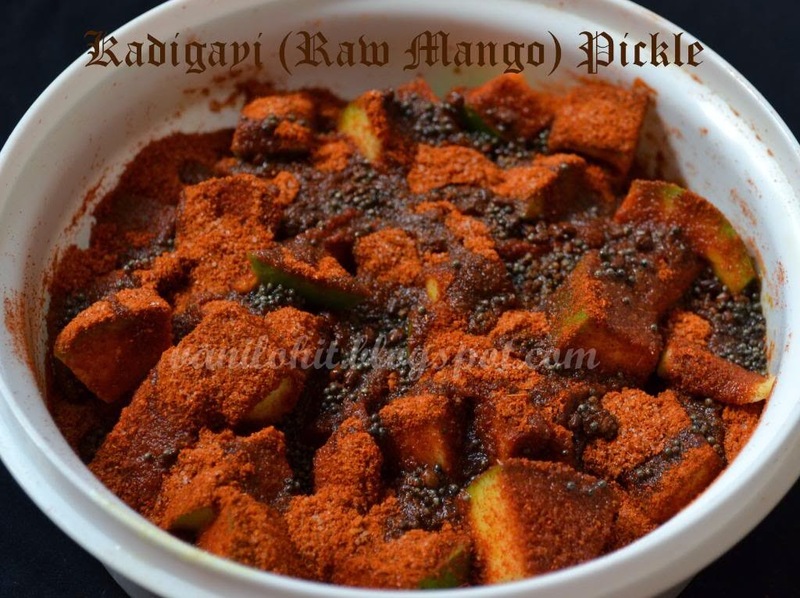 Kadigayi Pickle is one of the special varieties of pickle prepared using raw mango. 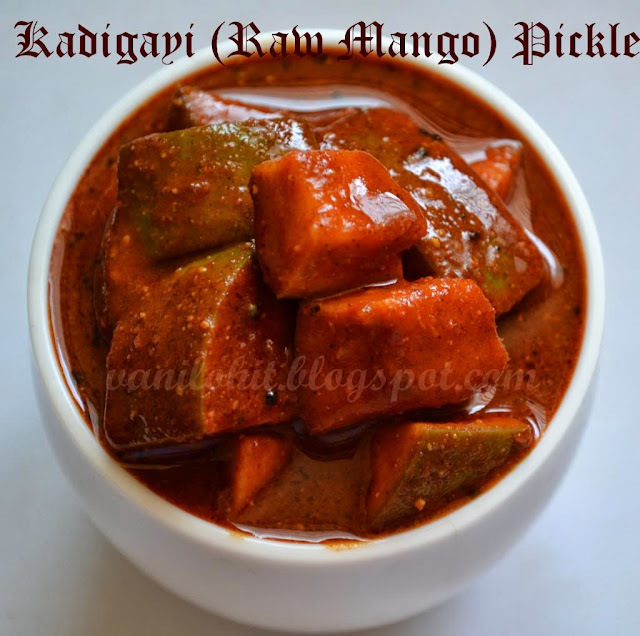 For pickles which we want to preserve for long time say, 1 - 2 years, only few varieties of mango can be used. But for this pickle, any variety raw mango which is sour in taste will go well. And this pickle will be good only for 1 - 2 months. 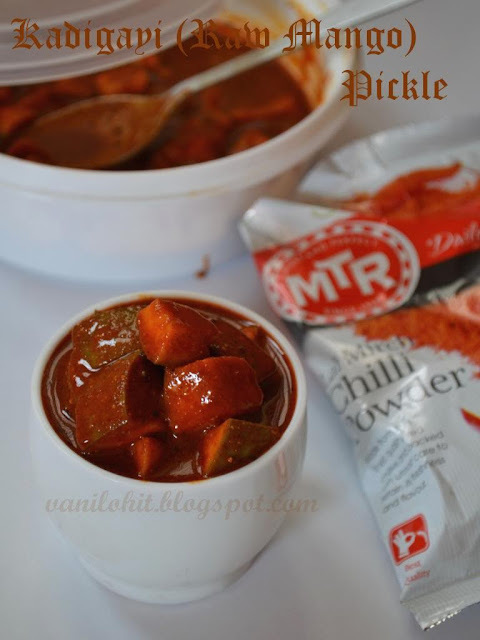 If Kadigayi Pickle is there for your lunch, believe me, simple curd rice will also taste like heaven!! Wash the raw mango and rub all the water with a clean towel. Cut it into medium size pieces. Add 2 tsp of salt and 2 tsp of oil to chopped mango and mix it. Cover it with a lid and allow to sit for 2 hours. In the meanwhile, prepare the masala powder: Dry roast pepper corn until you hear the crackling sound. Dry roast cloves, fenugreek seeds, cumin seeds, mustard seeds separately. Combine all the dry roasted ingredients. To this, add 1/4 tsp fenugreek seeds, 1/4 tsp cumin seeds, 3/4 tsp mustard seeds without roasting. 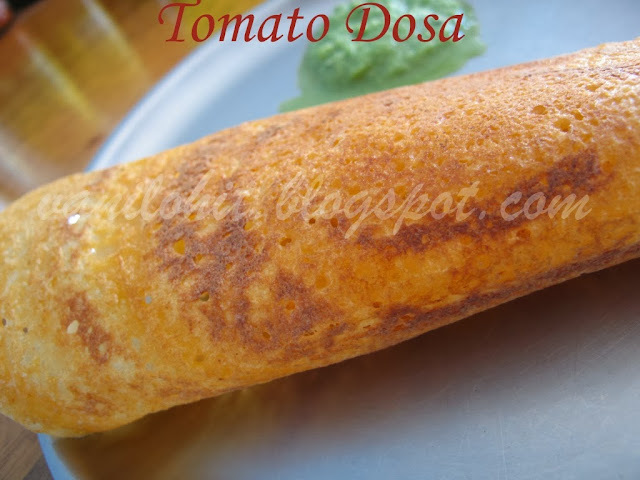 Add a big pinch of asafoetida and make a fine powder. Roast red chilli powder and salt separately under low flame for 1 - 2 minutes. Combine them with Masala powder prepared. Check and adjust the taste. Let the masala powder be little-bit salty coz mango pieces will absorb some salt once you prepare the pickle. Take a clean and dry bottle or container and put one layer of mango pieces. Then add one layer of masala powder, again one more layer of mango pieces, so on..till all the chopped mango is exhausted. Now, its the time to do the seasoning! Heat oil in a small wok. Add fenugreek seeds, mustard seeds, asafoetida and a pinch of turmeric. Once the mustard seeds start spluttering, switch off the flame and allow to cool. Once it is completely cool, pour the seasoning on the pickle mixture. Close the lid of the container tightly and leave it for 4 - 5 days before using. Open the container and mix the pickle once every day during this time. After 5 days, pickle is ready for use! Add the seasoning to the pickle after cooling completely. Otherwise, mango pieces will become smooth like cooked ones. Always use a clean and dry spoon for pickle to increase its shelf life. Vanilla ice cream is a good combination with this custard. I didn't had the stock of vanilla ice cream at home, so I have used black currant ice cream for a change. 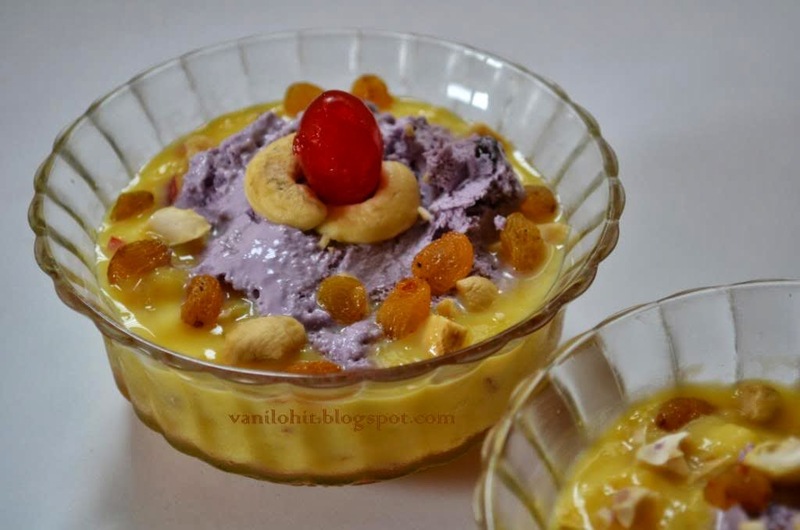 You can decorate it with the dry fruits of your choice. Pour the custard powder into 1 1/2 cups of milk and mix it well without any lumps. Heat it on medium flame. 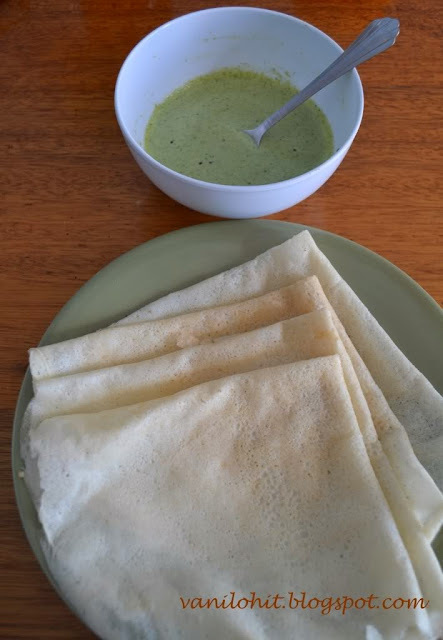 Keep stirring continuously and switch off the flame once it starts thickening and you reach the consistency of dosa batter. Allow it to cool down for few minutes. In the meanwhile, chop the apple and banana finely. Don't remove the peel from apple. Add the chopped fruits, sugar, pinch of salt and the remaining milk to the custard mixture and refrigerate it for 2 - 3 hours. 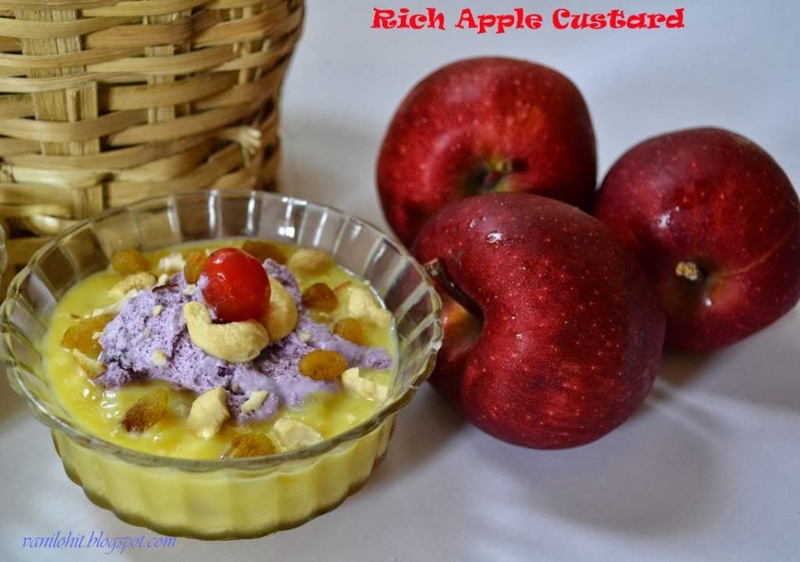 Before serving, distribute the apple custard into 3 bowls. Add 1 scoop of ice cream and put a cherry on the top of each. Garnish it with generous amount of cashews and raisins. 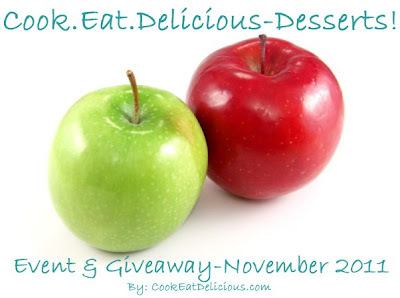 Sending this over to the event Desserts with Apples hosted by Nayana, which was started by Raven. Tambuli is a common side dish which accompanies our daily lunch during summer season. 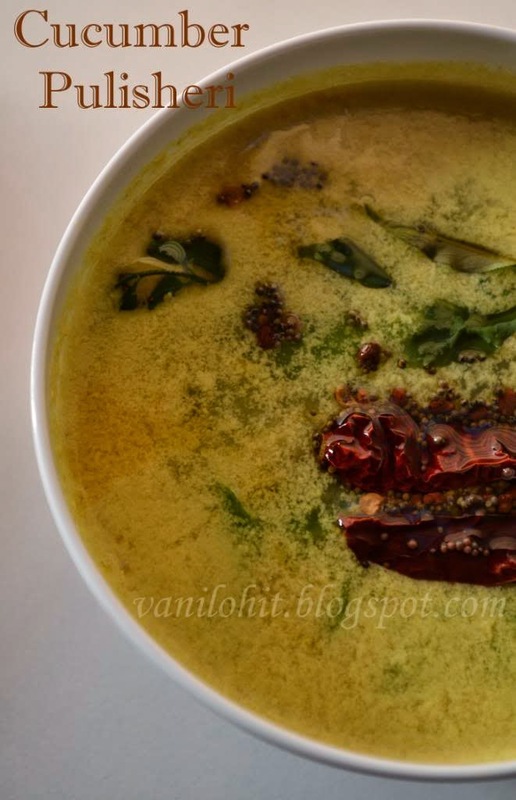 During hot summer, more than hot curries and sambar, cool ones like Tambuli and Appehuli will be more comfortable to have. Tambuli is also called as Tambli in common. Varieties of Tambuli can be prepared using simple ingredients available in our kitchen. 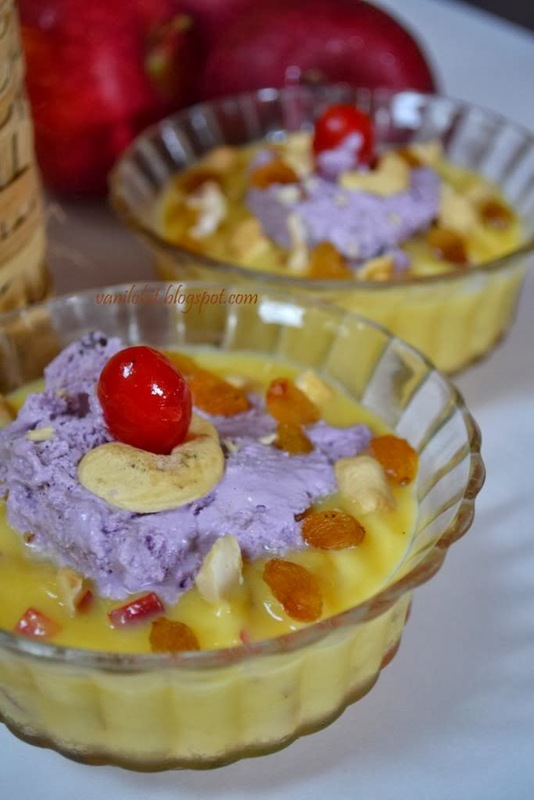 Almost all the varieties of Tambuli are prepared using buttermilk. 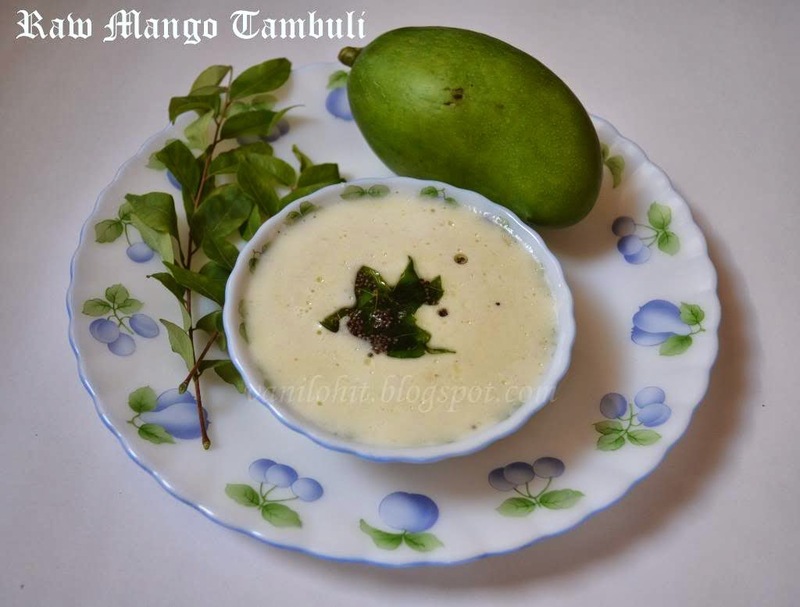 As per my knowledge, Raw Mango Tambli is the only Tambli for which buttermilk is not needed. 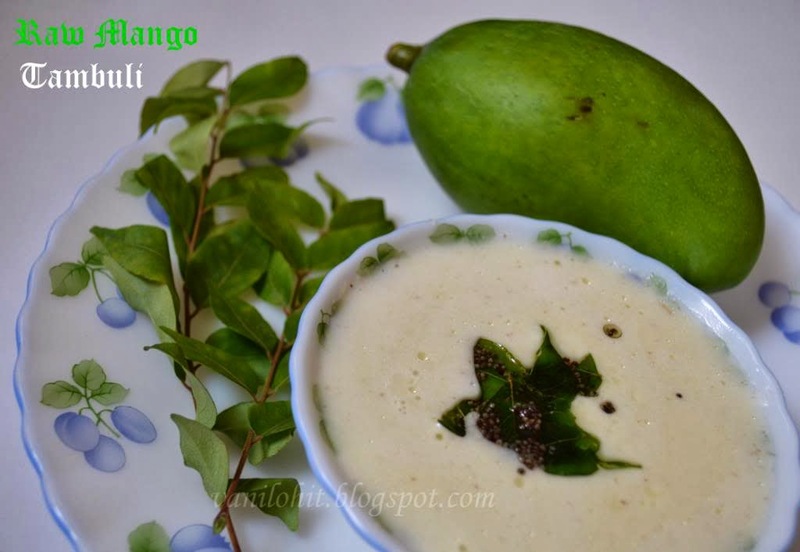 Any variety of raw mango which can be used for pickle will also be good for Tambuli. 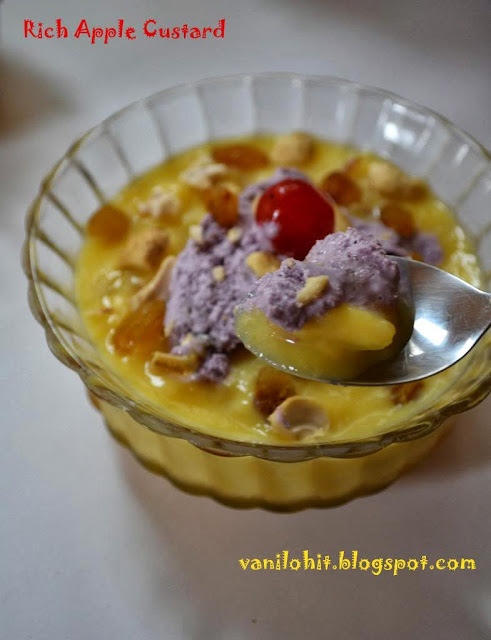 Try this Tambuli during hot summer to keep your body cool and I'm sure, you will like it!! 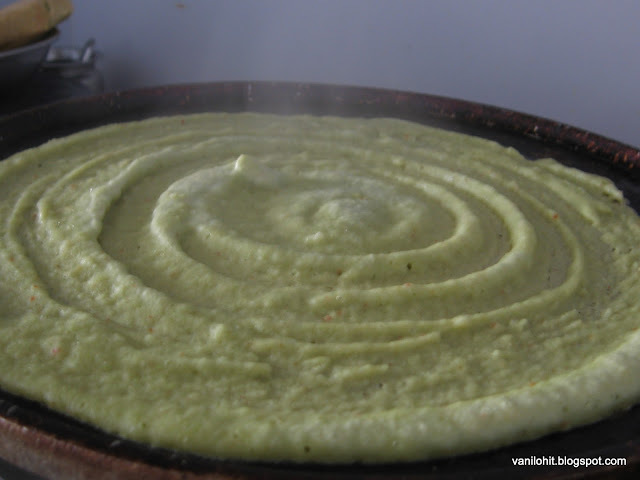 Grind the chopped mango, green chilli, grated coconut and mustard seeds into fine paste using little water. Transfer the paste to a bowl and add 3 - 4 cups water to adjust the consistency. Add salt to taste and mix well. Heat oil in a small wok. Add mustard seeds, asafoetida and curry leaves. Once it starts spluttering, switch off the flame and add the seasoning to Tambuli. Serve this healthy Tambuli with rice.